Office furniture systems contribute to a company’s brand, office culture, and employees’ productivity. As a preliminary step to choosing furniture, it is important for management to outline objectives and then choose the furniture that can support those objectives. Is the goal increased team productivity and creativity? Improved communication between employees and departments? A revitalized company culture? In most cases, achieving redesign goals comes down to finding the right balance of these three core criteria: flexibility, quality, and style. Since each of these core attributes contributes to price, organizations need to know how they influence business objectives and ROI. 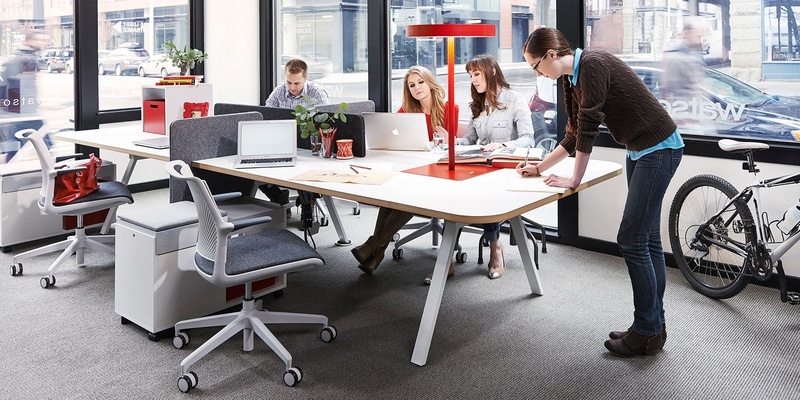 Furniture connects the workspace to its users. So it’s important to realize that flexibility is realized in different ways—employee preferences, team needs, and organizational culture. At the employee level, flexibility helps improve personal performance. Features like height-adjustability, mobility, and connectivity allow individuals to tailor their space to suit their own preferences. When users can modify their workstations according to their needs, they accomplish more. 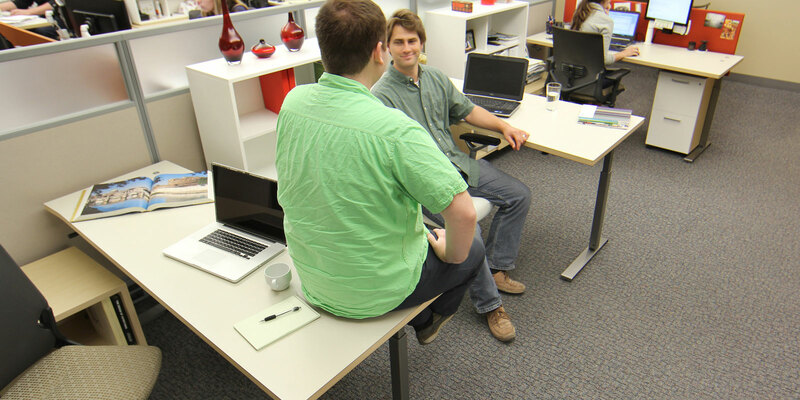 For example, The ReadWrite team improved productivity by 10% by shifting to standing desks. They found that a standing desk is more appropriate for tasks which accomplish a known final result because employees have a sense of urgency to complete them. Creative tasks, on the contrary, were performed better if employees could sit down, share their ideas, and unleash their imaginations. In addition to increased productivity, there is evidence that adjustable desks have a positive effect on health because they reduce the risk of several serious diseases. Other research has found that decreasing the amount of time sitting can increase life expectancy by 2 years. Furthermore, using ergonomic furniture can reduce employees’ health complaints by 50%. 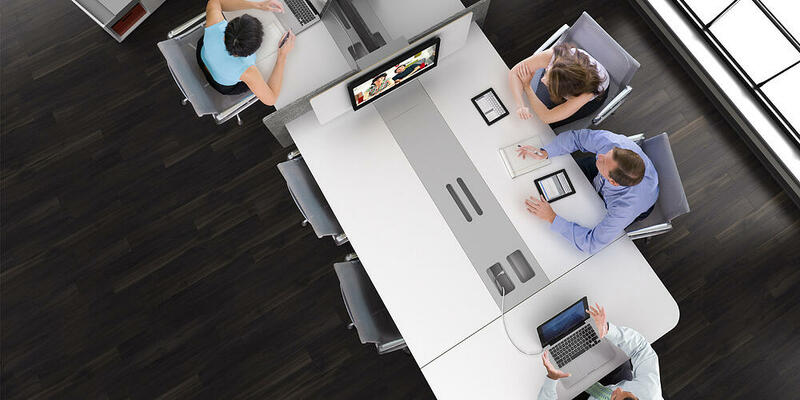 At the organization level, open office furniture systems increase collaboration and creativity. In an open office employees run into each other more often which encourages spontaneous conversations. This in turn facilitates innovation and a sense of community within the organization. Additionally, modular, free-standing furniture can be repurposed fluidly across teams and spaces, giving organizations the ability to be more responsive to seasonal and macroeconomic shifts. At the team level, modular furniture design increases a team’s ability to reconfigure its space on the fly. It makes the workplace multifunctional, because workstations can be moved easily and quickly, while reducing the resources (time and staff) it takes to reconfigure. When a team grows, for instance, managers can reorganize the furniture accordingly. Furthermore, some managers prefer to move the furniture every quarter or so, which can diversify and rejuvenate the workplace environment. Menlo Innovations is a good example of how an open office design works well on the team and organization levels. At this software development company, coding is performed in pairs. Each week, developers change their coding partner, and they are allowed to move their furniture. By modifying the working space, developers look at tasks from new perspectives. According to the company’s CEO, giving employees the freedom to move their furniture has produced tangible results in team creativity, engagement, and enthusiasm. Flexibility is about creating a dynamic physical environment for employee and employer to achieve individual and business goals. With increased reconfiguration comes more wear and tear. Part of being designed for flexibility means the durability to stand up to frequent reassembly and movement. What does durability look like in office furniture? It means core materials, mechanisms, and surfaces that adapt to regular incremental changes and continues to perform to manufactured quality expectations. Let’s look at core material first. Most mass produced manufacturing departments invariably come under pressure from the accountants to “value engineer” the product (which is a nice way of saying reduce costs). One of the ways this happens in furniture is by using cheaper and thinner core material. As companies switch from Fir to Pine, and downgrade from 1¼-inch worksurfaces, the surfaces feel cheaper and sag over time. Additionally, hardware plays an important role in durability. Lifting mechanisms, handles, or caster wheels must be reliable because these parts experience more traction in an open office furniture system than in any other work environment. Some manufacturers have switched to plastic injection-molded parts, which do not wear well and often need to be replaced. Another important place to look for durability is in component fasteners. Threaded metal inserts can handle significantly more reassemblies. Finally, surfaces of desks, conference tables, benches, cabinets, and storage units should be high quality, hypoallergenic, and scratch-resistant. Furniture plays a significant role in overall interior design. When the space has fixed qualities, furniture can add dimension to the design. For example, if a startup has an innovative, disruptive culture, and its office is located in an old building, they may want to furnish the space with contemporary furniture design. This can create an interesting juxtaposition of old and new and convey a powerful brand statement. Well-selected furniture helps convey the organization’s personality and brand, be it through application, function, or color. It's frequently overlooked that furniture can consume the majority of the visual field in many office environments. But the space aesthetics go beyond visual attractiveness and can also have an effect on productivity. Thus, the design and stylistic relevance of office furniture is a key criteria when the primary objectives are creating a sense of community or reinforcing company culture. As the old saying goes, you get what you pay for. Higher quality components often increases cost. But with a better understanding of these three primary criteria, smart organizations can ensure the best return on investment (ROI) by investing in the attributes most important for their needs. For instance, life expectancy will vary based on high vs. low traffic, high vs. low hourly utilization, and single- vs multiple- user situations. Organizations may need to decide whether an investment in more custom-designed components will be better spent in unnassigned or assigned spaces, open or private environments. It’s important to look beyond the MSRP and consider the total cost of ownership over the lifespan of the investment. Many organizations will consider estimated lifespan and repair costs when estimating ROI. But also consider labor and maintenance costs involved with making routine adjustments and reconfigurations, which can be significant over 5 to 10 years. Office redesign is successful when it reaches well-defined goals. When it comes to selecting furniture, those unique goals inform the relative importance of the key attributes of flexibility, durability, and style. In today’s agile work environment, many companies will conclude that all three of these attributes are vitally important. But rarely is budget unlimited. You will never go wrong with furniture that plays its role in the overall aesthetic, that offers flexibility for individuals and teams, and that stands up the increased demands of a fluid workspace.